Applicants under 18 years of age must be accompanied by a parent. Applicants under 18 year of age must be accompanied by a parent. An Enhanced Driver’s License (EDL) is a dual-purpose, optional card that combines a standard driver’s license with a border crossing document. The card allows a Minnesota resident to re-enter the U.S. by land or seaport when returning from Canada, Mexico, Bermuda or the Caribbean, speeding passage back across the border. There are specific requirements for obtaining an EDL. Always check with your destination for ID requirements before traveling. *EDL are only processed W-F from 9:00am to 3:00pm. REAL IDs set the requirements for state driver’s licenses and identification cards to be accepted for federal purposes such as boarding an airplane for domestic travel or entering certain secure federal facilities. 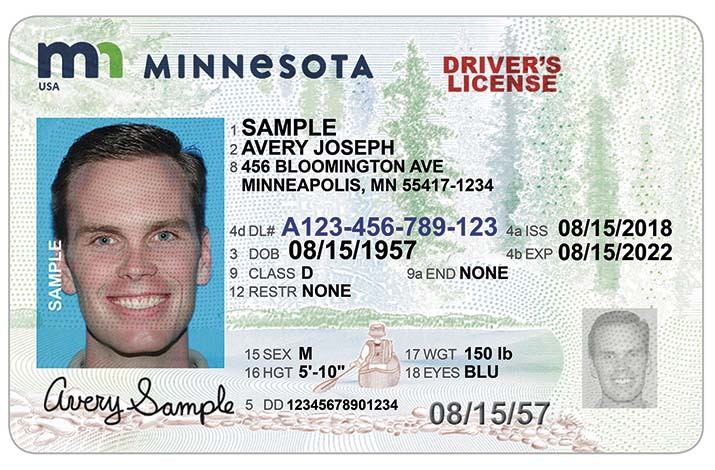 REAL ID-compliant driver’s licenses and identification cards will be available in Minnesota beginning October 1, 2018. See Driver’s License & ID Options. For more information, please visit Driver & Vehicle Services. Driver’s license manuals are available for purchase or can be viewed online. You have 60 days after moving to the State of Minnesota to obtain a State driver’s license and Minnesota license plates.